The self-contained wireless data logger, which works with Onset's free HOBOmobile® app for logger setup and data management, enables you to access data anytime from mobile device for iOS or Android over a 30m range, and it requires no dedicated equipment beyond a mobile device for configuring the logger or reading out data. View data in graphs, check the operational status of loggers, configure alarm notifications, and share data files. Battery Life: 1 year, typical with logging interval of 1 minute. Faster logging and/or statistics sampling intervals, entering burst logging mode, and remaining connected with HOBOmobile will impact battery life. Excessive readouts, checking of Full Status Details, audible alarms, and paging all impact battery life. Visual alarms and other events can have a marginal impact on battery life. 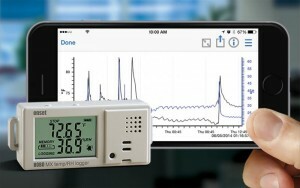 Onset's HOBOmobile app, a free download from the iTunes or Google Play app store, makes it a snap to configure HOBO MX1101 temperature/RH data loggers and manage the collected data. Right from a mobile phone or tablet, users can view data in graphs, check the operational status of loggers, share data files and graph images for analysis in Excel, Numbers, and other applications, and store data in the cloud. HOBOmobile also makes it fast and easy to set up audible alarm notifications so users are immediately notified of problems.